Tuscany: the home of art, culture and history. Sarteano lies in the very centre of Italy, halfway between Florence and Rome. It is easy to reach, either from the A1 motorway (the “Autostrada del Sole”) or the station in Chiusi. With its pure, clean air, peace, quiet, archaeological riches and biodiversity, this Tuscan town is one of the region’s true gems. 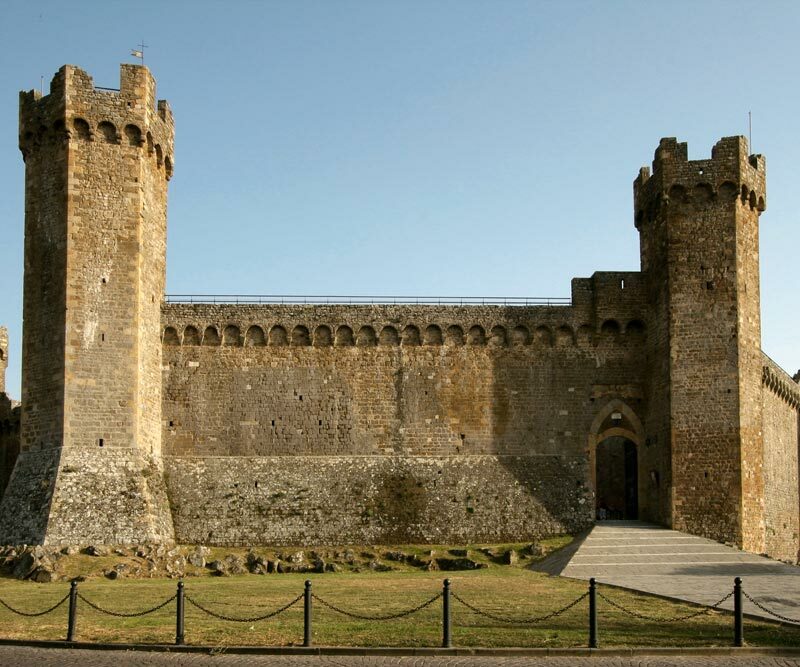 The Castello delle Moiane – a fortified settlement dating to the 12th century – bears witness to its medieval past. A few miles from Sarteano, in an area of woodland, the complex is, in part, preserved in good condition. 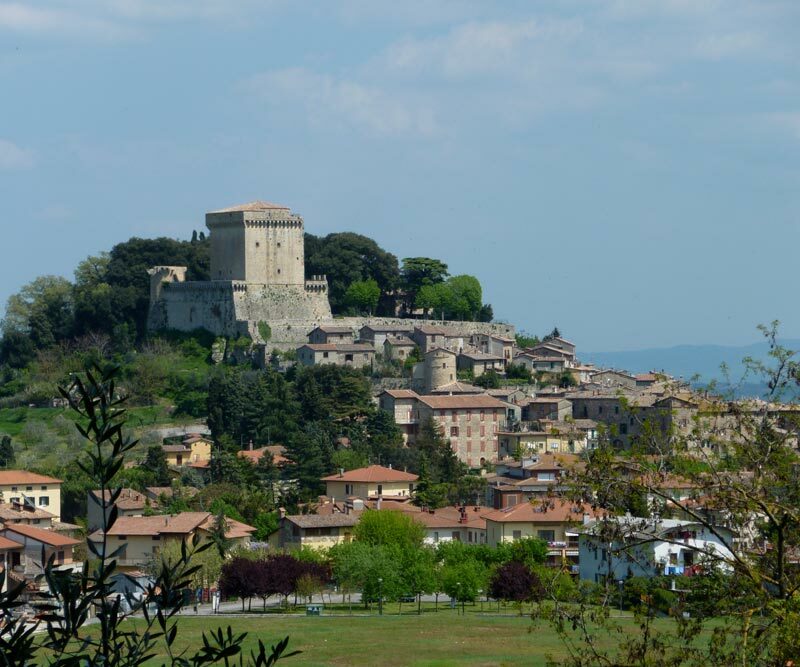 La Fortezza – the Fortress – looms over the town, a square keep surrounded by a double wall, with a round tower on each side. There are countless historic palazzi and period churches to be visited, offering a delightful flavour of times past. Lastly, there is no point trying to resist the many gastronomic specialities that the area has to offer. A trip to satisfy the palate and the soul. 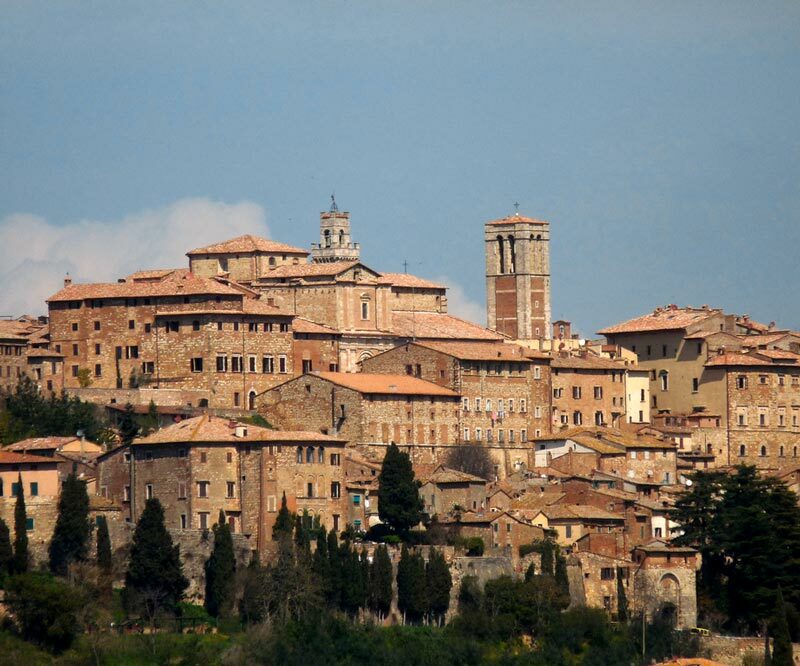 Montepulciano is the archetypal Tuscan town: entering via the main gate you embark on a journey through time, from the Middle Ages to the Renaissance, arriving at last at the highest point of the city, Piazza Grande. 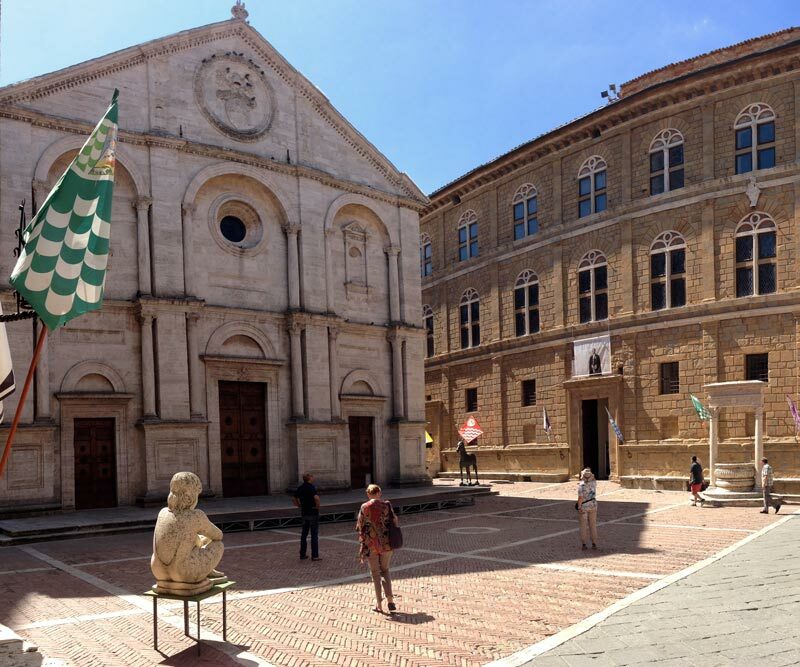 This square is the heart of Montepulciano. Each of the four sides features a variety of beautiful palazzi: the 14th-century Palazzo Comunale, Palazzo Contucci, Palazzo Nobili-Tarugi, the Palazzo del Capitano del Popolo, which overlooks the elegant forms of the historic “well of the griffins and lions”. Visitors to the cathedral can admire Taddeo di Bartolo’s Assumption triptych, and the Virgin and Child painted by Sano di Pietro. Walking through the square, you will pass streets crammed with aristocratic residences and countless little shops selling the area’s famous wine and other local specialities. Chiusi is the modern descendent of the Etruscan city of Chamars, which enjoyed the pinnacle of its power and wealth under the reign of Lars Porsena, between the 7th and 6th centuries B.C. Its inestimable historic and cultural heritage has earned it international recognition as a centre of archaeological importance. Via Porsenna, with its wealth of medieval and Renaissance buildings, the Piazza del Duomo, dominated by the Bishop’s Palace, the Bell Tower and the Cathedral, the Museo Civico, a treasure trove of Greek and Roman pottery and Etruscan artefacts – just a few of the artistic and historical wonders on offer. 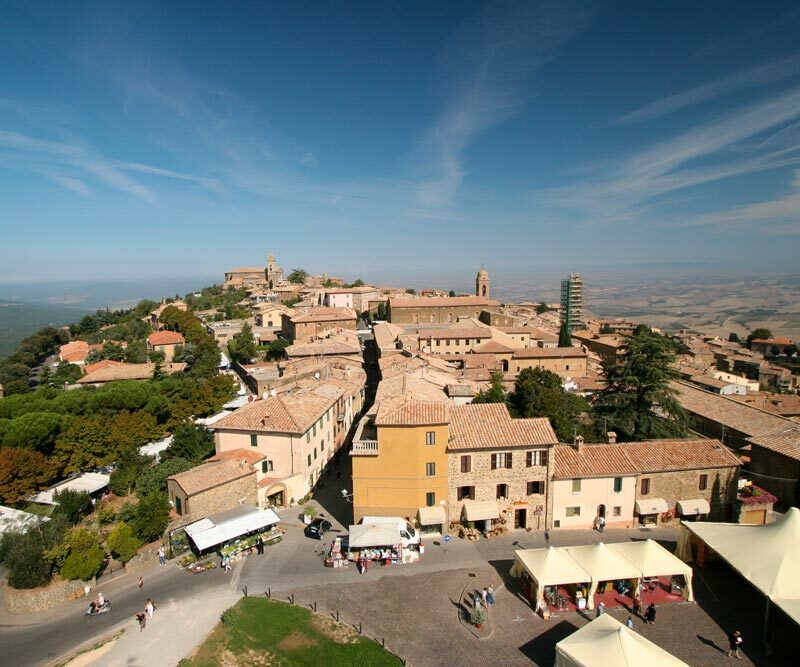 Just as beautiful are the Lakes of Chiusi and Montepulciano; ideal for sports and food-and-wine-themed excursions. 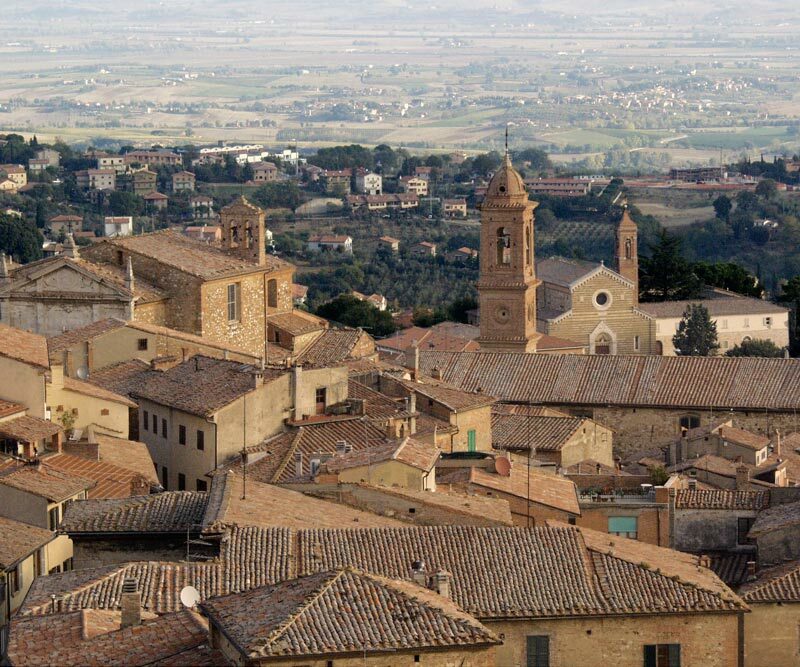 Pienza was created at the request of Pope Pius II, who entrusted Leon Battista Alberti with the task of transforming the little medieval town of Corsignano into the ideal Renaissance city. 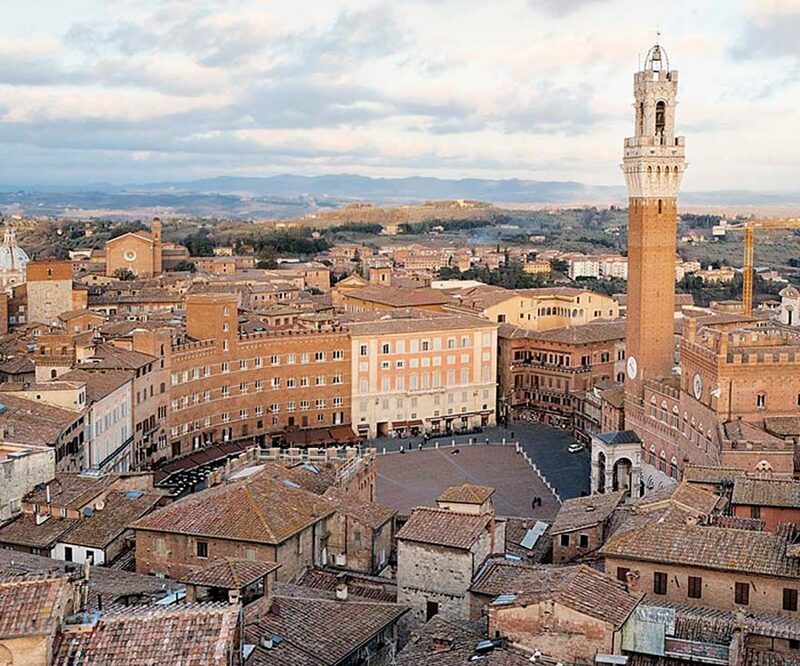 Thus was this extraordinarily beautiful town brought into being in just three years, a testament to Pius II’s determination to establish a town that would be different from, and indeed more beautiful than Siena, from which his family had been exiled. As with many of the towns near Siena, it is crossed by a single main street (Corso Rossellino) which leads to a large piazza. 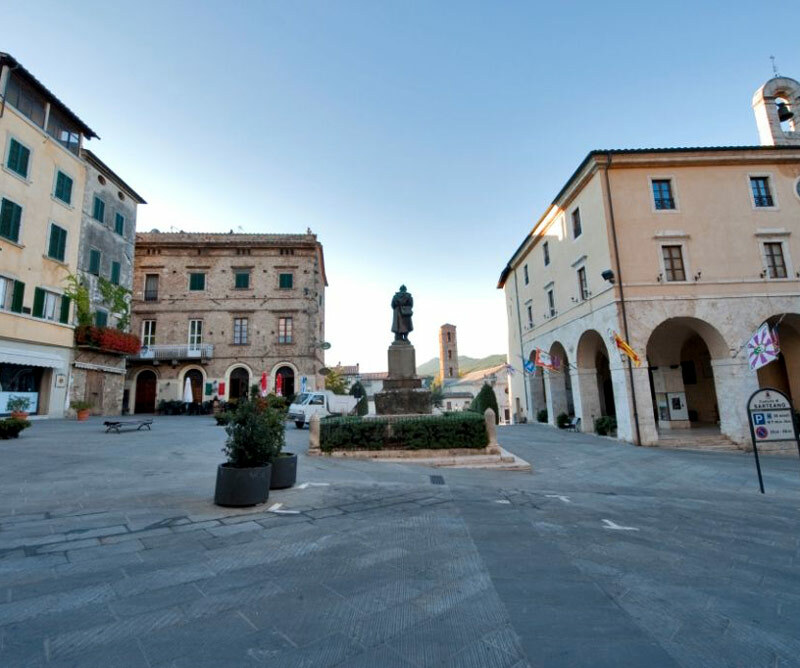 This is Piazza Pio II, which has a distinctive trapezoidal shape and herringbone pavement. 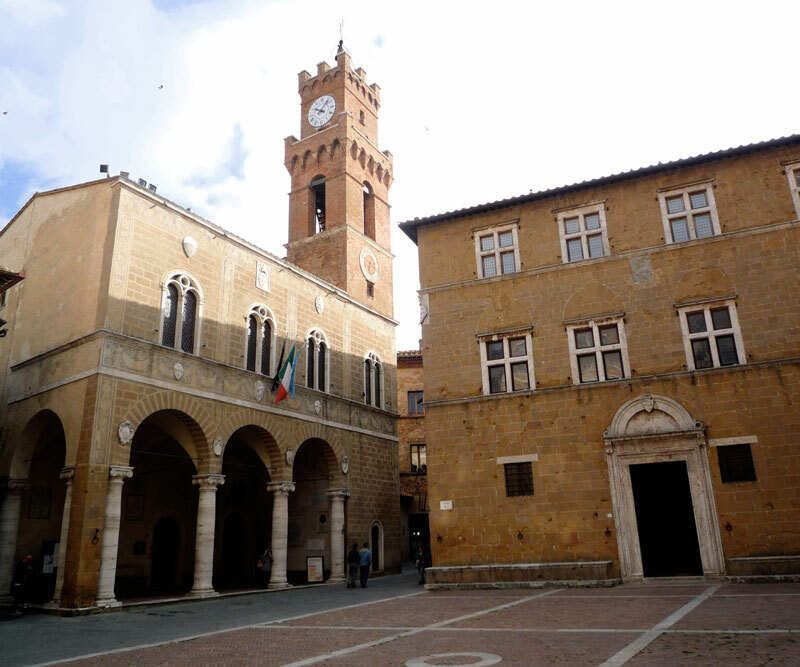 The Cathedral, the Palazzo Piccolomini and the Palazzo Comunale – the town hall – surround a well, just a few metres apart. Take care not to lose yourself among the many little shops along Corso Rossellino, which offer unmissable treats such as Pecorino di Pienza, the famous local sheep’s cheese. 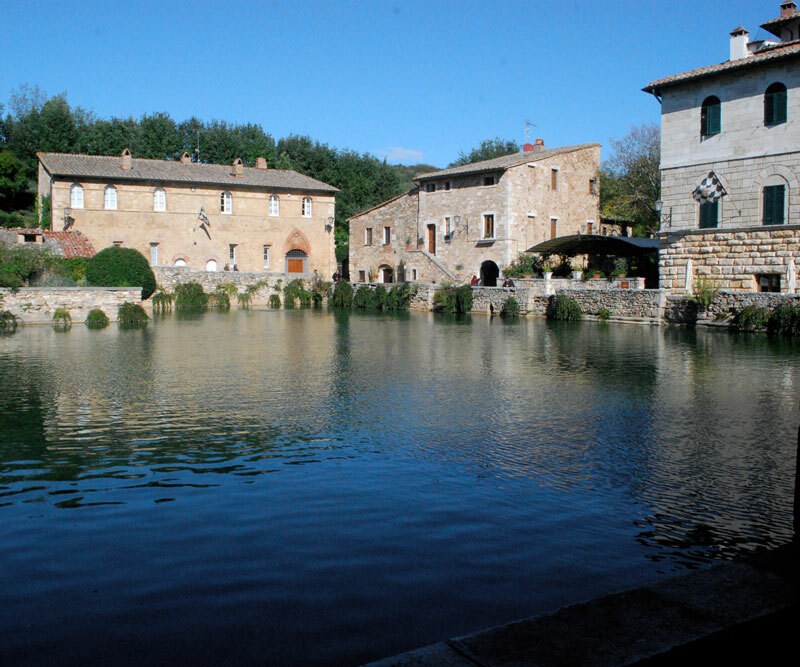 It is no exaggeration to claim that the piazza in Bagno Vignoni is one of the most beautiful in all the world. What other town or city can boast a main square that is filled with spring water that bubbles up at 52°C? The water collects in a great basin around which the village was built, and around which it has grown. 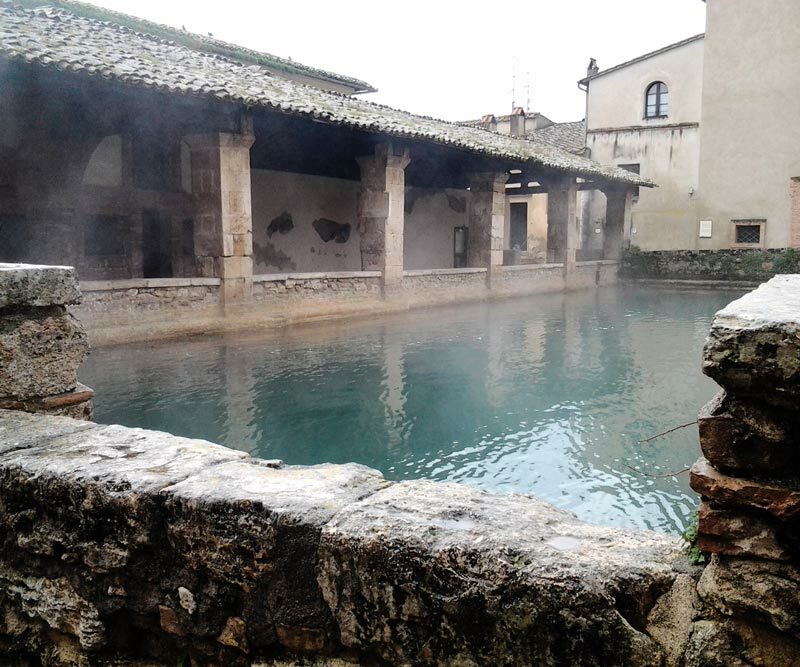 Enjoy an unforgettable experience, immersing your feet and hands in the streams of hot water that run, from the piazza, around the entire of the village. Once upon a time these little channels fed Bagno Vignoni’s mills (which were recently restored, and can be visited). Now they provide the perfect chance to relax and unwind following a long day exploring the hills and towns near Siena. From its hilltop perch, in the shadow of the fourteenth-century fortress, Montalcino gazes out over the Ombrone and Asso valleys. Throughout its history, it has been the city’s fortune to be situated in an area much prized for the cultivation of grapes. Indeed, the wines produced here, such as Rosso, the Sant’Antimo and the much-celebrated Brunello, have earned the Montalcino terroir fame and renown all over the world. The city is still encircled by the walls built in the 13th century. 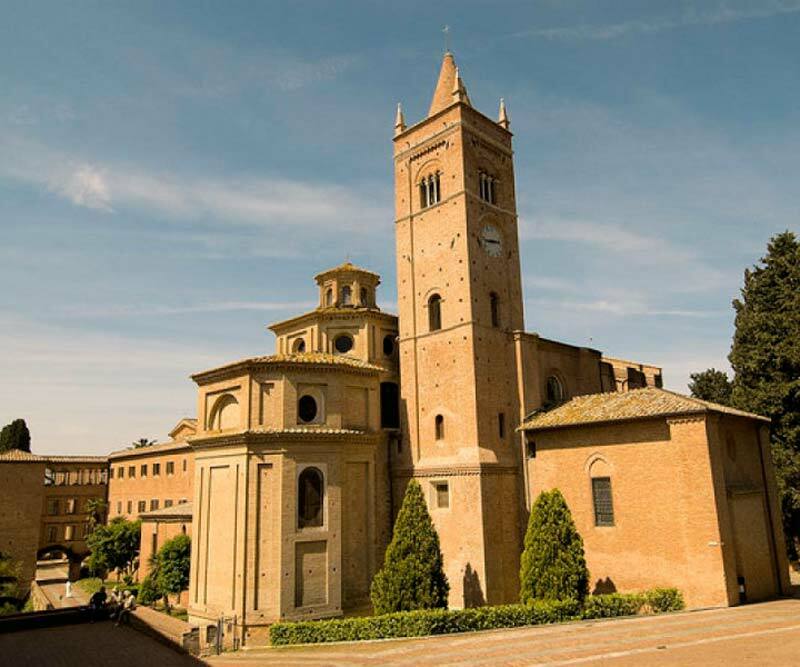 Walking its narrow streets, past artisan workshops and little cafés, you can stop to admire the Palazzo Comunale – the town hall – the Bishop’s Palace and the churches of Sant’Agostino, Sant’Egidio and San Francesco. 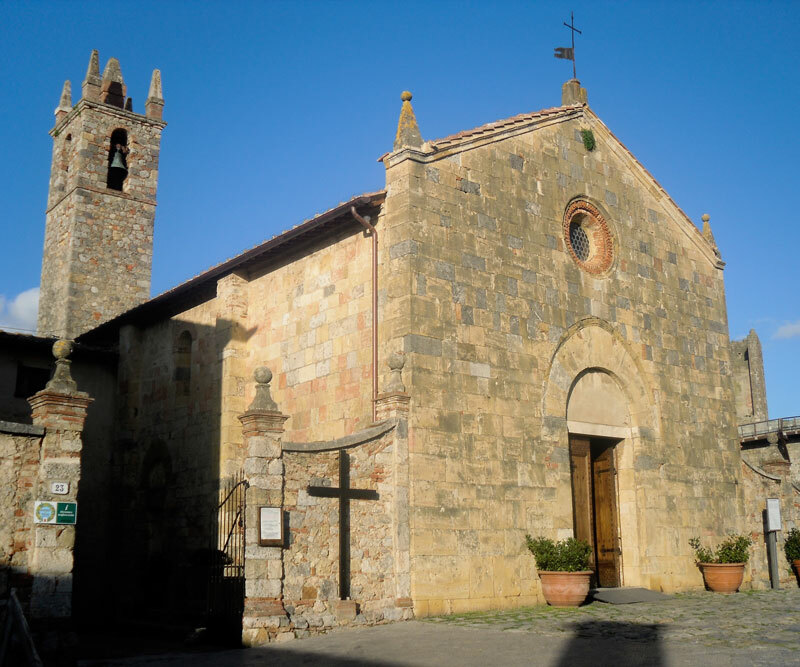 A short journey from the city, in the village of Castelnuovo dell’Abate, you can immerse yourself in the magical atmosphere that surrounds the Sant’Antimo Abbey which was built at the request of by Charlemagne in the year 781. 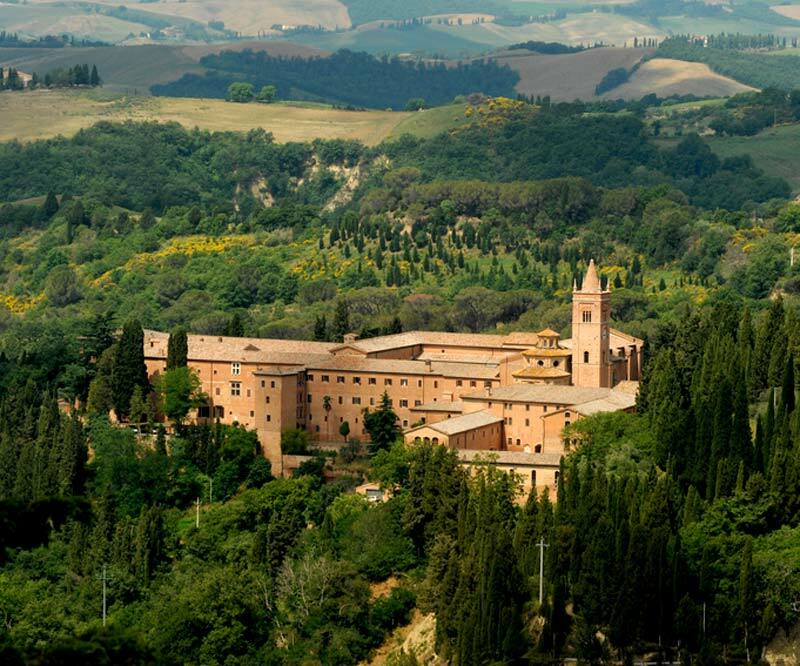 Established in 1313 by Saint Bernard Tolomei, the Abbey – the Abbazia di Monte Oliveto Maggiore – is built on high ground, protected on three sides by unscalable cliffs. 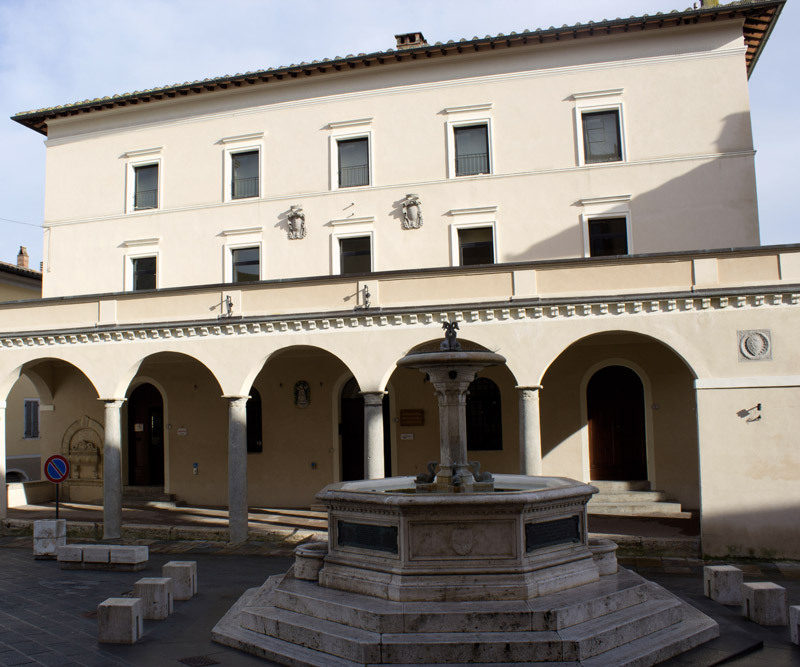 The Abbey is currently the seat of the Benedictine Congregation of Monte Oliveto and houses the Institute of Book Conservation. The Great Cloister, hub of the entire complex, and home to a series of frescoes depicting episodes from the life of Saint Benedict, gives access to the church. The church’s current layout, with its single, central nave dates to the fifteenth century, but the interior was later remodelled in Baroque fashion. Alongside many other works, the church can boast the most important example of intarsia wood inlay in Europe, a wooden choir by Fra Giovanni da Verona. The “Middle Cloister”, where one can admire Sodoma’s fresco of the Coronation of the Virgin and another fresco by an unknown artist, which depicts the deposition, gives access to the Monastery Library and to the Pharmacy where a rich variety of medicinal herbs are preserved in 17th-century vases. 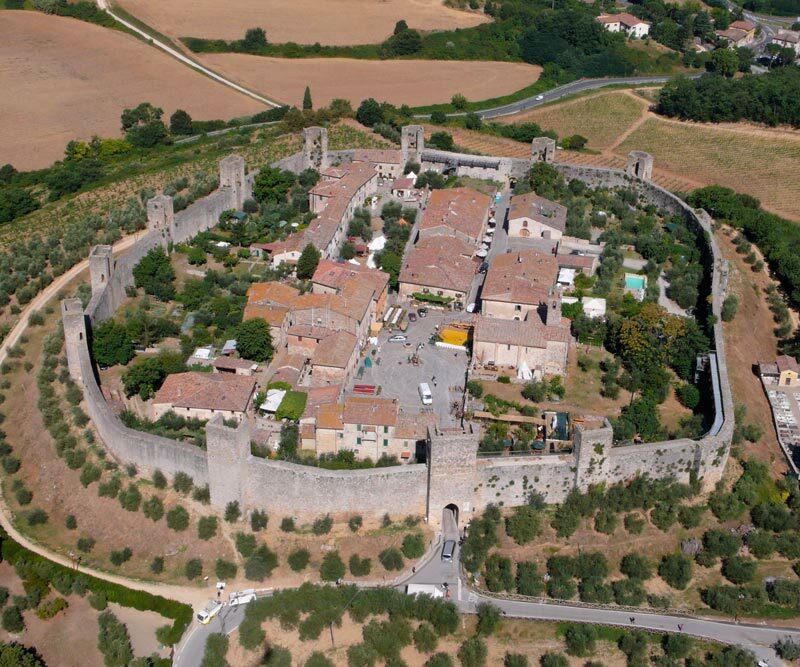 The best way to enjoy a view of the whole the town of Monteriggioni in a single glance is to take a walk along the medieval walls that surround it. These are the same walls that left such an impression on Dante that he refers to Monteriggioni in the 31st canto of his “Inferno”. The 14 towers built to defend these lands – which for centuries were contested by Florence and Pisa, being conquered repeatedly by one city, then the other – are still intact. 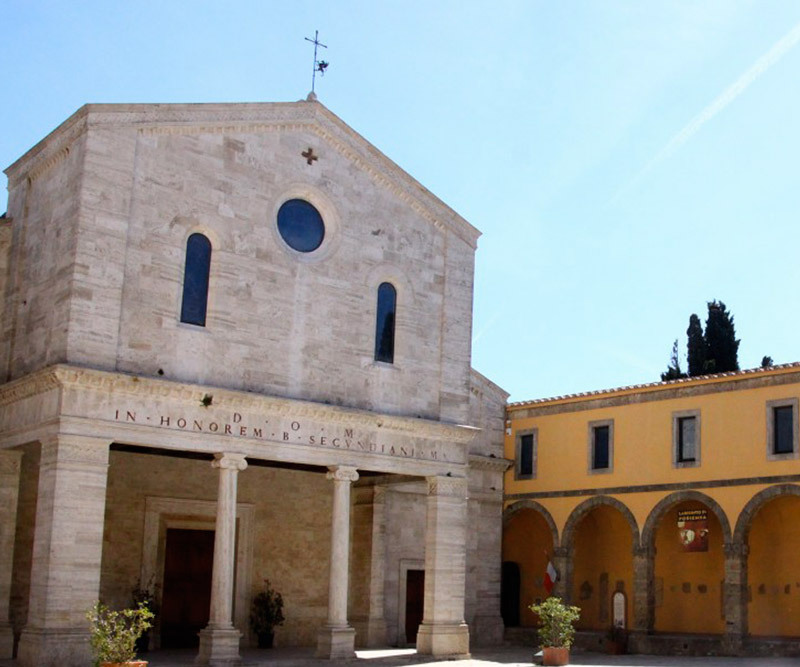 Today, the invasion is in the form of tourists, artists and writers, who flock to the town attracted by the calm, relaxed atmosphere of the only large, open space, Piazza Roma, which is flanked by the Pieve di Santa Maria Assunta church and restaurants serving local specialities. 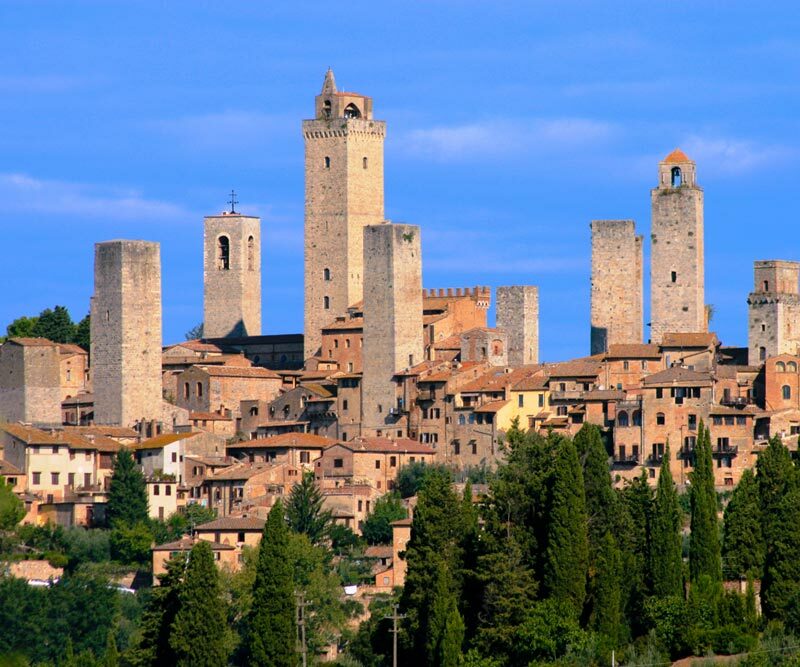 Even at a distance of many miles, the 15 towers of San Gimignano emerge like a mirage from among the Sienese hills. 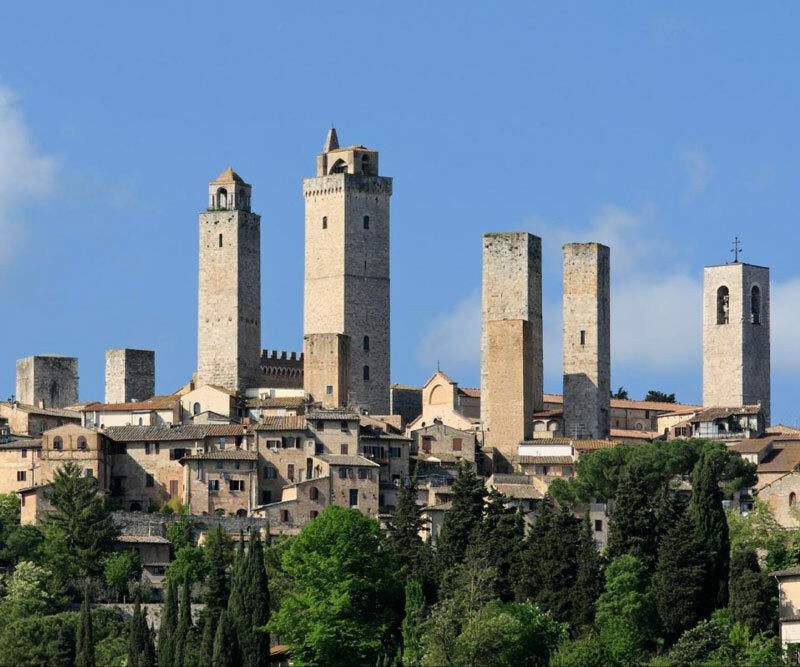 Here is the same view that travellers would have enjoyed in the Middle Ages, although in those days the towers of San Gimignano numbered 72. Entering the town through one of the two gates, the visitor is catapulted into the atmosphere of the Middle Ages. A single, main street climbs to the town’s principal piazza, only to descend on the other side. The frescoes in the cathedral and the church of Sant’Agostino are particularly impressive, while the Museo Civico in the Palazzo Comunale – the town hall – houses a number of extraordinary masterpieces. An interesting diversion from the route through the town is offered by the two sections of the Museum of Torture, where one can learn of man’s capacity to invent instruments of suffering and death. 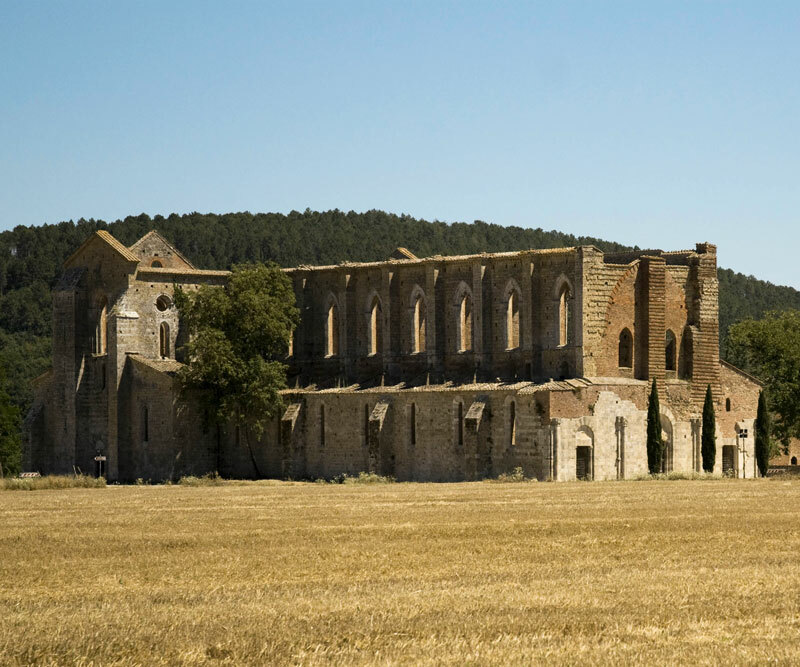 The Abbey dedicated to San Galgano provides a truly breathtaking spectacle. Picture a basilica built to a Latin-cross plan with nave and side aisles, 72 metres long and 21 metres across, with its walls still intact but … no roof. Indeed, the whole of this Cistercian abbey is still standing, but it has lost its covering. 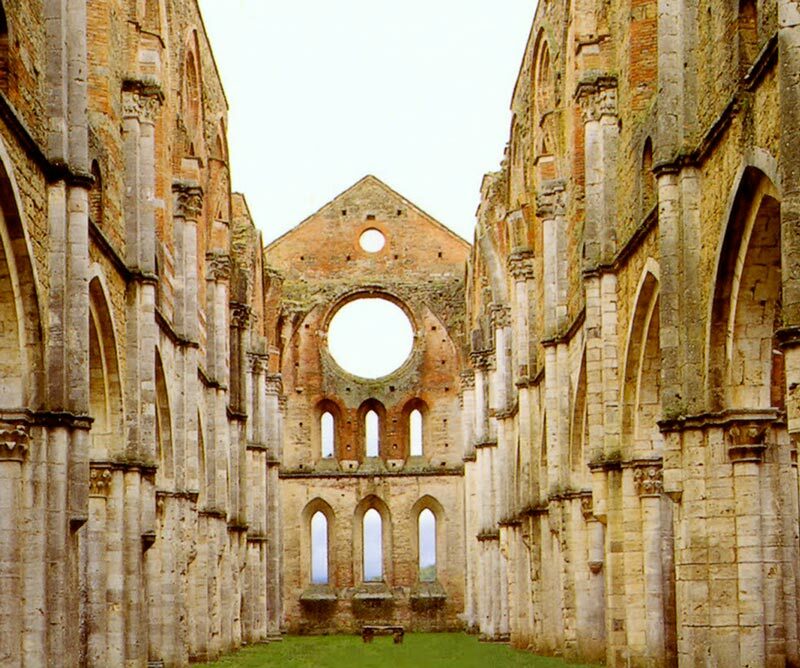 From the splendour of the 14th century, the Abbey fell into decay, leaving the yet-magisterial ruins we see today. A short walk away, on the Montesiepi hill, the sword of Galgano Guidotti is embedded in the rock. In the throes of religious conversion, this formerly arrogant, violent nobleman plunged his sword into the ground to signify that he was renouncing his violent ways, and to create a crucifix with which to pray. To attempt to describe this unique city is futile, such is its beauty, and such are its … inhabitants! Crazy folk, some might say (and the Florentines certainly would)! Everything and nothing is well known when it comes to Siena. 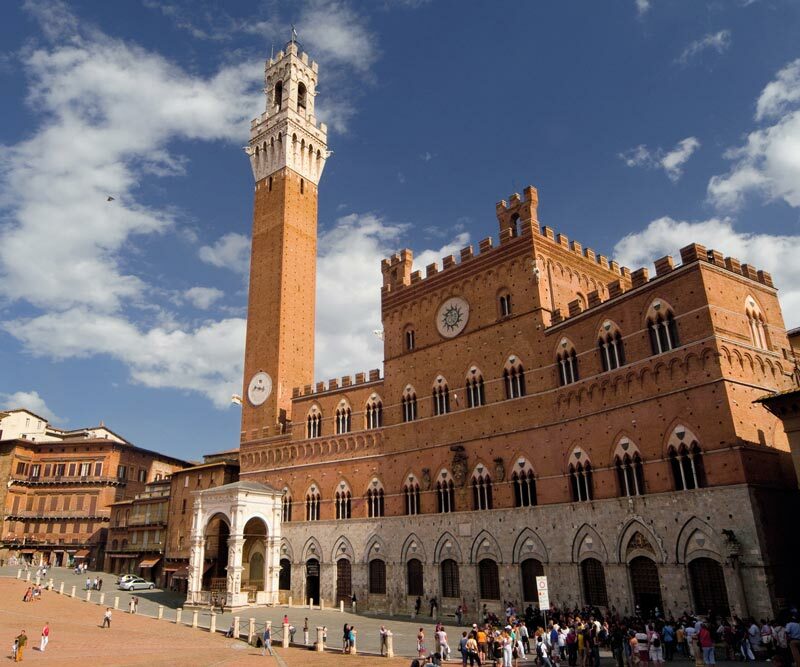 The famous “Palio” is an example of how the city has never abandoned its identity as a “city-state”.